Something a little bit different! 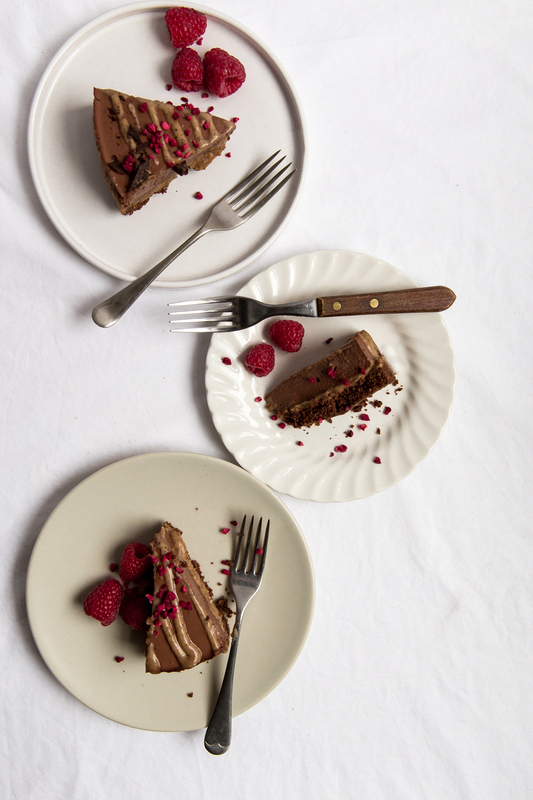 I feel lucky to be sharing a recipe post from Monalogue today. Meet Mona, friend and fellow Instagram-obsessive. We met through the app a little over a year ago now, which still blows my mind for a number of reasons. I’ll save that for a specific Instagram gushing blog post though. 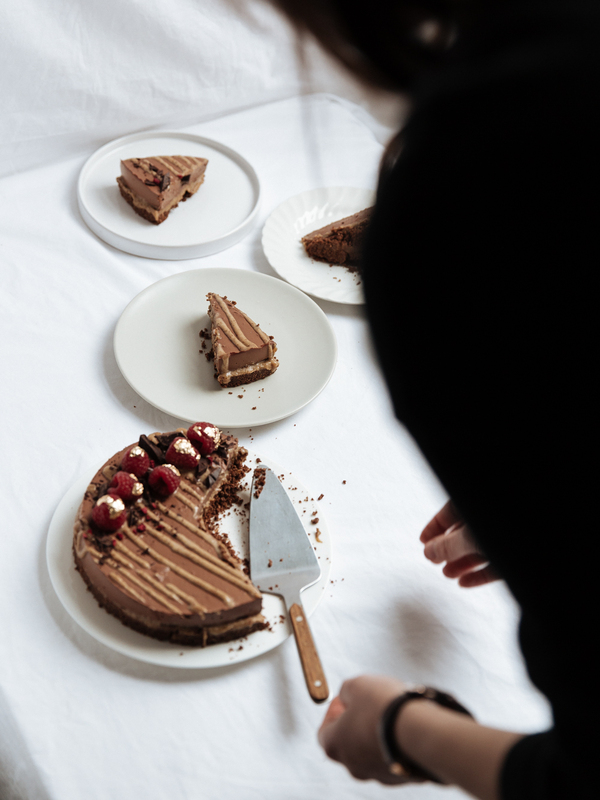 We first met at an event where Mona provided the dessert options for guests, one of which was a raw chocolate cheesecake with raspberries on top. I remember it so well and have been pestering for the recipe ever since. For selfish reasons really, I just wanted to make it and eat it all to myself! 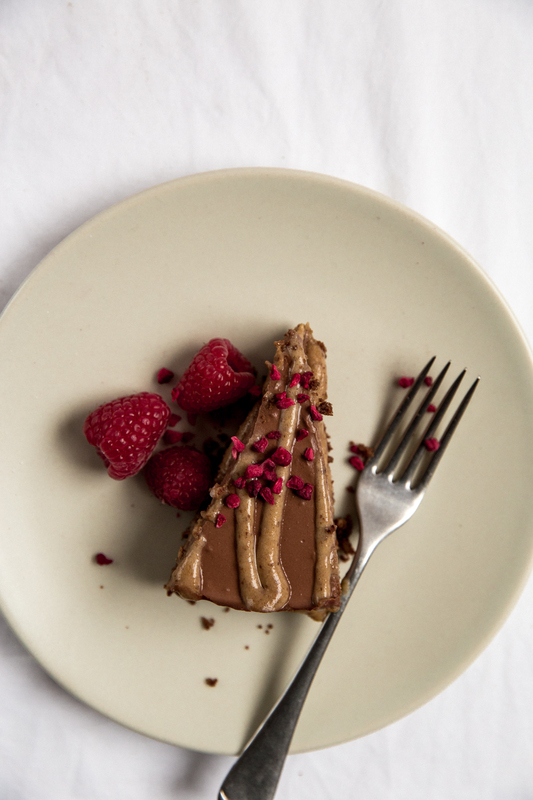 I’ve got to admit, I used to roll my eyes at the idea of raw desserts, only seeing the fad and trends behind it. After my first sample of one last year I definitely feel a lot more open minded to these recipes now. Sure, there are some instances where a pudding should just be a pudding. But if I can swap out a few things here and there for health benefits without compromising on the flavour, I’m game for this too. I will stick to what I know when it comes to food, but I’m always fascinated by way in which Mona bakes. She’s really got these kind of recipes down! 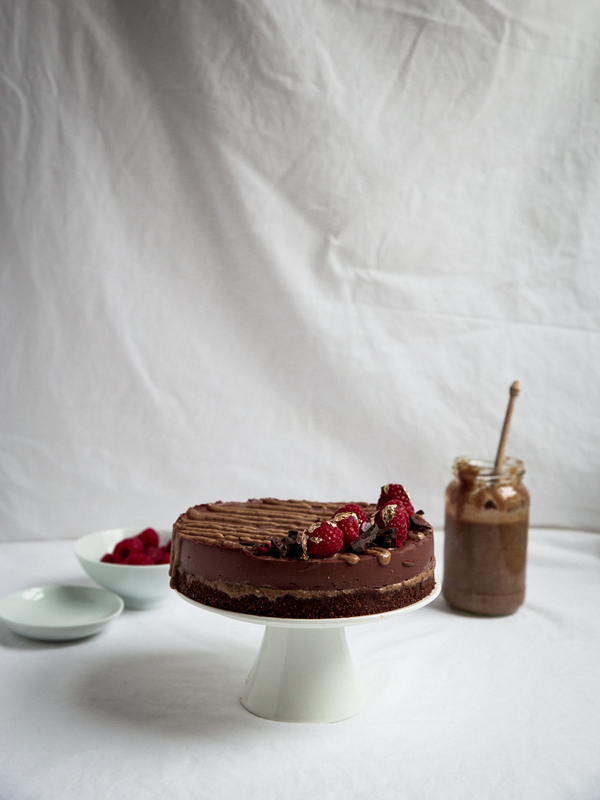 Have a look over on her blog for more vegan and healthy based dessert inspiration. Spray a cake tin with oil spray, and line with baking parchment if the tin doesn't have a removable base. Begin making the cheesecake base by placing the bran cereal, cacao powder and walnuts in a blender. Blend these ingredients until they reach a consistency similar to sand. Dissolve the sweetener tablets in approximately 3tbsp of boiling water. Add the dissolved sweetener to the blender, along with the coconut oil and agave/honey. Blend for 30 seconds, or until base ingredients are mixed and appear damp. Press the base ingredients into the bottom of your cake tin. Press the layer firmly with your hands - this will keep the layer from falling apart. Set the cake tin aside when complete. In a clean blender, add the soaked dates, himalayan salt and coconut cream. Blend until a smooth and creamy texture is reached. Note that this might need a little patience - the caramel will be very thick, your blender may need breaks to avoid overheating. Remove half of the caramel from the blender, and spread evenly over your cheesecake base layer. Add the almond/soya milk to the caramel remaining in the blender. Blend until mixed, and set aside. This will be the caramel to drizzle on your finished cake. You're now ready to make the final chocolate layer. Begin by mixing the skyr yogurt/vegan cream cheese with the cacao and cocoa powders. Using a whisk or electric mixer will ensure a smooth mix. Dissolve the sweetener tablets in approximately 3tbsp boiling water, add to the yogurt and cacao/cocoa mix and whisk. Dissolve the gelatine in approximately 3 tbsp boiling water. If it doesn't fully dissolve, heat in the microwave for 5-10 seconds at a time and stir, repeating until dissolved. (Note - if you are using agar instead of gelatine, you will need to heat it on a hob and boil for 5 minutes to activate). Add the dissolved gelatine/agar to the mixture and whisk well. Heat the coconut oil in the microwave until melted, this shouldn't take longer than 20 seconds. Add the melted coconut oil and vanilla essence/paste and stir. Pour the chocolate layer into the cake tin. 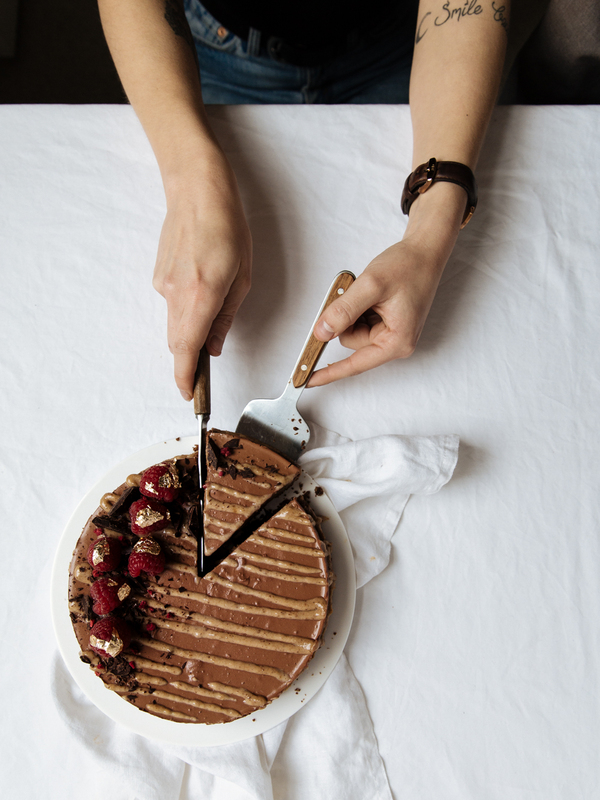 Make sure the layer is spread evenly by smoothing it with the back of a spoon, or by shaking the cake tin lightly from side to side. Place the cake in the fridge for a few hours to set. Remove the cake from the tin, drizzle with the reserved caramel, and decorate to your hearts content. Enjoy! (and remember to keep and leftovers stored in the fridge).